Mechanical refrigerator cars began replacing ice bunker cars in the early 1950s. 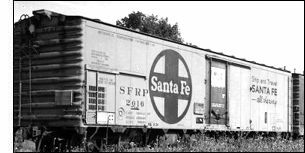 Many of the first mechanical reefers were rebuilt steel ice bunker cars. Roco's model is of a generic design from the earlier days of these cars. As they had with the rest of their modern cars, Roco used solid-journal Bettendorf-type trucks instead of roller bearing trucks (a mistake made by nearly every other manufacturer at that time).